The HAYWIRE 7 FUSED WIRING SYSTEM is popular with our COBRA Guys. *GM Color Coding and Fully Labeled American Made Wire. *High Temp GXL, Moisture & Chemical Resistant Wire. *Ground Wires are already installed with this kit. Great for Fiberglass bodies. *Dash Headlight Switch, Ignition Switch & Dimmer Switch. *Includes GM Connectors for Headlights, Headlight Switch, Turn Signal Connectors & Dimmer Connector. *Horn & Radiator Fan Relays. *Friendly and Knowledgeable Tech Support. *AMERICAN Made wire is used in all of Haywire & Co., llc's wiring harnesses and kits. Haywire 7 Fused Wiring System, Ignition Column & Dimmer Column / ea. Haywire 7 Fused Wiring System, Ignition Column & Dimmer Floor / ea. 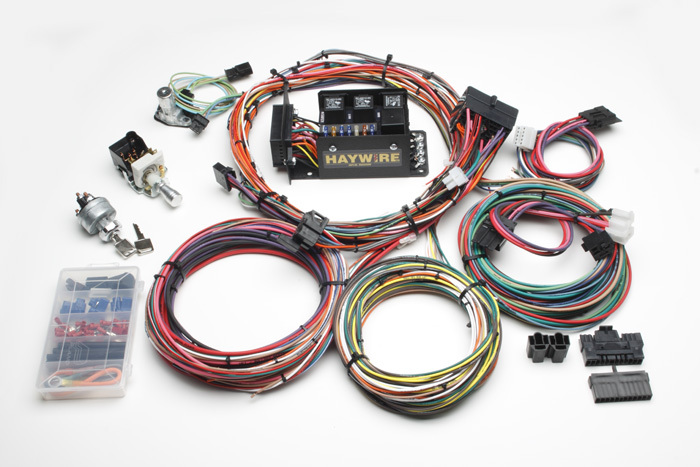 Haywire 7 Fused Wiring System, Ignition Dash & Dimmer Floor / ea.